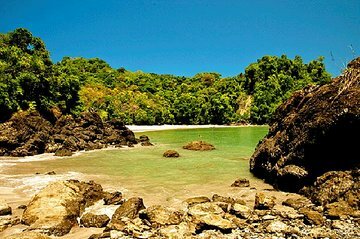 Take a day trip from San Jose to Manuel Antonio National Park, which has some of Costa Rica’s most scenic and pristine coastline. After pickup from your hotel, travel along the coastline to the nature preserve, where you will hike in as cars are not allowed in the park. Once inside, swim, sunbathe, or hike the trail to Cathedral Point. First of all this is a very long day. You will be traveling in a small minibus, and it tends to be cramped. That being said, it was still a wonderful trip. After breakfast we passed a river filled with crocodiles, part of the many variety of animals we were able to see. The park is massive and it's a lot walking. Dress comfortably, and prepare yourself with both hiking and beach clothes. We didnt see any sloths, however we did see monkeys, birds, butterflies, and my personal favorite, the coati. On the way back we stopped at a lookout point overlooking the Pacific Ocean. Overall, it was a great day that I would recommend to anyone, however I wouldnt recommend to young children. First of all, be prepared its a long day and trip from San Jose. You will be traveling on a minibus and it can be cramped. However, It is a wonderful day. Breakfast just outside of Jaco was great, and you get a quick view of river full of crocodiles. The National Park is massive, and its a lot of walking. We made it to all 5 of the beaches, with each one becoming less and less populated. Wear comfortable clothes to hike in, but bring beach attire with you. We saw birds, monkeys, butterflies, and my favorite, coaties. Unfortunately, we didnt see any sloths. On the drive back we stopped and took a picture in Jaco overlooking the Pacific Ocean. Great decision for this trip and I would recommend.